Overflowing with the earthy hues of our native flora, the Matilda is a sensational way to celebrate the spirit of Australia. 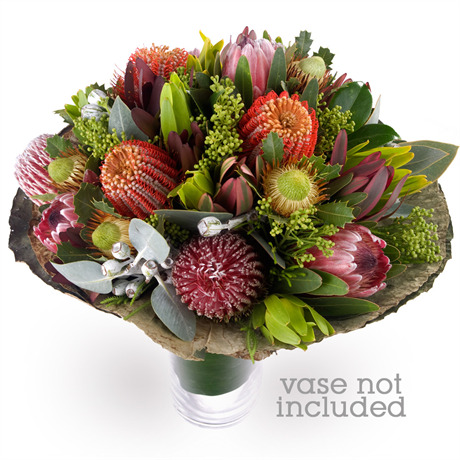 This flavour of bushland and outback features desert red banksias, blush pink proteas, silver tetragona nuts, leucadendrons and tufty yellow dryandras among complementary foliage. Impressive, understatedly beautiful and enriched with the essence of our country, the Matilda is a perfect gift for somebody who enjoys native flowers. With a swirl of earthy red, blush pink and mossy green, it conjures up images of the dusty outback, the cacophony of cicadas and crickets in the bush, and infinite mountain ranges. We recommend purchasing a large vase to house your flowers, eliminating the need for your recipient to arrange them.